The U .S. Geological Survey (USGS), in cooperation with the Santa Clara Valley Water District (SCVWD), has completed the first of several multiple-aquifer monitoring-well sites in the Santa Clara Valley. This site monitors ground-water levels and chemistry in the one of the major historic subsidence regions south of San Jose, California, at the Coyote Creek Outdoor Classroom (CCOC) (fig. 1) and provides additional basic information about the geology, hydrology, geochemistry, and subsidence potential of the upper- and lower-aquifer systems that is a major source of public water supply in the Santa Clara Valley. The site also serves as a science education exhibit at the outdoor classroom operated by SCVWD. Figure 1. 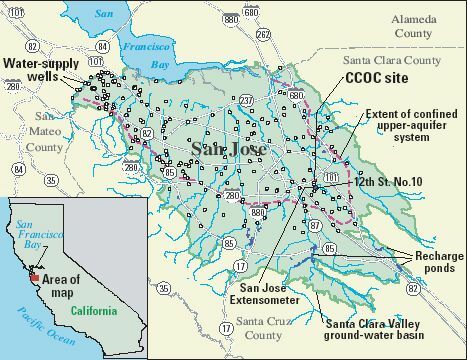 Location of multiple-aquifer monitoring-well sites, CCOC, Santa Clara Valley, California.